Move away Tesla, everyone else is hot on your heels. From electric cars to electric powered solar roofs. Competition has finally caught the wind and is after you. Nissan from the far east is one of them but it isn’t in Japan but rather in the Netherlands that Nissan has confirmed the switch-on of the largest collective solar roof at its facility in Amsterdam. Installed on the roof of Nissan Motor Parts Center (NMPC) located in the country’s capital, the solar roof consists of almost 9,000 photo-voltaic panels and produces enough renewable electricity annually to power up to 900 households. It will also significantly reduce the facility’s CO2 output and in total, it is estimated that the solar roof will save 1.17 million kilograms of CO2 per annum. With the ability to produce almost 70% of NMPC’s annual energy, the installation of this immense solar roof represents a significant milestone as Nissan strives to make its operations more sustainable across Europe. Additionally, energy generated by some of the panels will be fed directly into the country’s national grid. 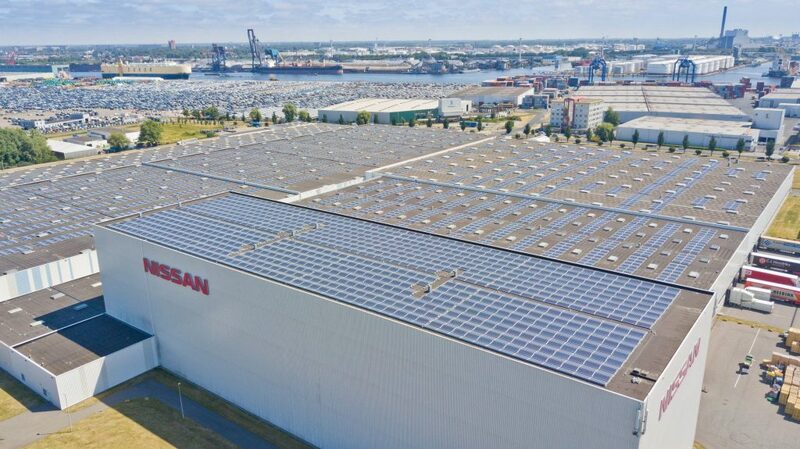 Francisco Carranza, Managing Director, Nissan Energy said: “Nissan is committed to reducing the environmental impact of our facilities across Europe and we are delighted that we can today confirm the switch-on of the solar roof at our parts centre in Amsterdam. The project is the result of the first major collaboration between residents and a company, with part of the project financed through a national crowdfunding scheme. Following the success of this project, NMPC is now considering the next phase of projects to further reduce the facility’s environmental footprint. To discover more about Nissan’s EV range and Nissan Intelligent Mobility checks out, #ElectrifyTheWorld on social media channels or visit: http://www.nissan-europe.com/.